The Toshiba Satellite U840 is the latest consumer Ultrabook from the company and the first to offer a 14-inch display, which was nice and vibrant when we got the chance to see it in action. The hardware load-out is fairly typical for the latest generation of Ultrabooks, with a third-gen Intel Core processor and up 8GB RAM. There is a 32GB SSD to keep things speedy and 500GB of hard drive on offer. 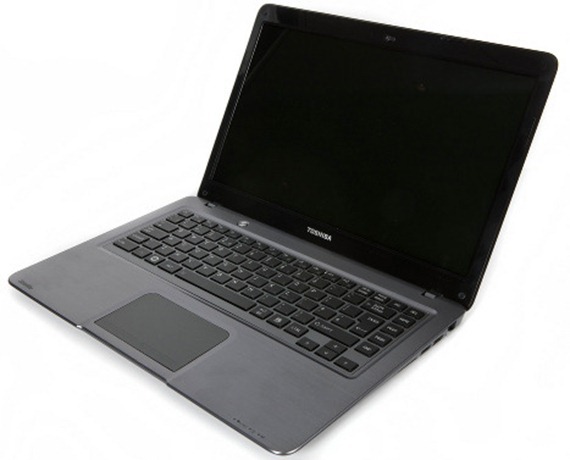 Toshiba's 14in Ultrabook offers a good mix of light weight, thin design and useful features. It's a good all-round Ultrabook, but it could use a better screen and keyboard, as well as some tweaks to its build quality. It performed decently in our tests, but it comes with lots of pre-installed software that can sometimes get in the way -- be prepared to uninstall some stuff! The Toshiba and Samsung and other 14in Ultrabooks show that the Intel Ultrabook strategy is having an impact. While initially promoted as being for superslim 11in and 13in machines, the Ultrabook is really about forcing the laptop makers to stop being lazy and deliver laptops with better portability, usability and battery life across the board. And judging by the Toshiba U840, laptop buyers can only benefit.